In 1985, Caroline Werner, David Haas, Donna Turner, Pat Woicek, Chou Thao, Marilyn Cooper, Patricia Eldred, John Givens, Peter Taylor, JoAnna Williams-Brown, Shoua Her, Roland Krogstad, Helene Pesche, Francisca Rodriguez, and others joined together and created a festival to celebrate the diverse cultures of the community, showcase the neighborhood talent and enhance communication between the various complexes in the Triangle. The provisional name of the celebration was the Bayview International Festival, but about two months before the celebration took place the name had been changed permanently to the Annual Triangle Ethnic Fest. Billed as “a unifying force in drawing the elderly, individuals with disabilities and family residents of the area together,” the first Ethnic Fest was held on Sunday, October 13 from 1:00-5:00 PM. Residents provided all food and entertainment. The menu that year included food from Laos, Vietnam, Nigeria, Colombia, Mexico, and America. Entertainment was modest by today’s standards. During the four hours the first Fest ran, only seven acts graced the stage. This grew to over twenty entertainers in two locations, children’s events, and numerous displays and vendors, the connection with our modest beginning remains: Blues singer Judy McNeal’s brother Kenneth gave one of the seven performances in 1985. Although represented by a different troupe, traditional Hmong dance was also one of the seven. And the Hermanos Avila, who would grow to become the Ballet Folklorico de Los Hermanos Avila, performed Mexican Dance. The 1985 festival also brought an exciting performance of a new style called breakdance by Steve Lauritz, Jr. and Charles Green. 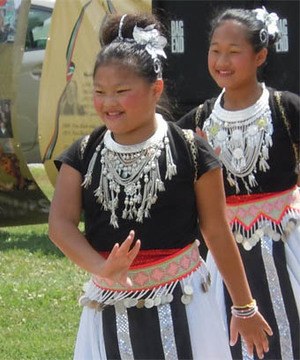 The Triangle Ethnic Fest took place on the third Sunday in August for 35 years. The last Triangle Ethnic Fest was hosted on August 14, 2014.